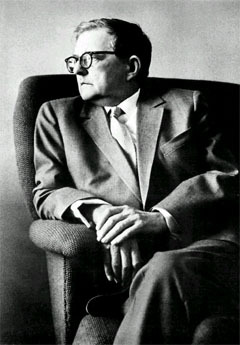 In 1938 Shostakovich composed his Second Jazz Suite at the request of the recently founded State Orchestra for Jazz conducted by Victor Knushevitsky. This suite was originally scored for a complete symphony orchestra to which four saxophones, an accordion and a guitar had been added. The Jazz Suite no. 1 in three movements, composed in 1934, had been written for a smaller ensemble. The title ‘Jazz Suite’ is rather misleading, as the composer definitely uses the style of light music. Back in 1928, the twenty-two-year-old Shostakovich had already composed some light music. A bet among friends to make an orchestration of the popular song ‘Tea for Two’ in less then one hour time, caused him to compose ‘Tahiti Trot’. Shostakovich easily won the bet as he completed the original and witty arrangement within only forty minutes!